You wonet believe the gorgeous sunset views from this spectacular seven acre property that sits quietly at the end of a private lane, with a stunning backdrop of mature trees, level pasture land and gently rolling hills that back up to an amazing golf course. Ites the ideal home for horse lovers. Located in College Grove, 6539 Eudaily Covington Road is a bright and airy two story home with 2,825 square feet, four bedrooms, three full baths and parking capacity for two. It also includes a separate large metal truss barn that can house up to five horses, and features the tranquil sounds of a nearby creek. 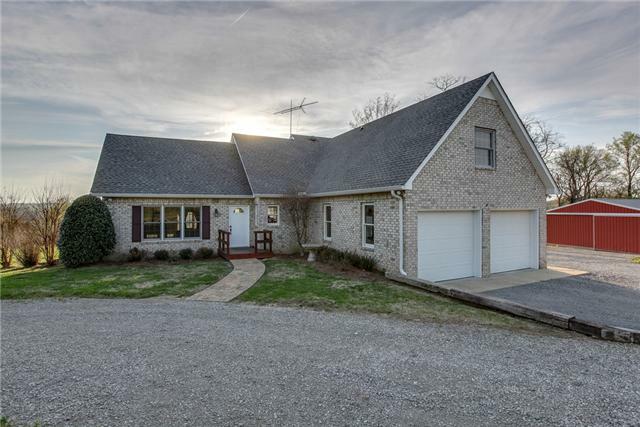 The home at 6539 Eudaily Covington Road is a custom brick home with soaring ceilings in the spacious living room, with great potential for anything you can imagine. Attached to the living room is the eat-in kitchen, featuring a wall of windows and a French door that leads to the back deck also with picturesque views of the stunning vistas. The cookes kitchen includes gleaming hardwood floors, recessed lighting, beautiful wood cabinetry, a center island and counter height bar area, with ample workspace for the chef. Also included are a gas stove, neutral granite counter tops and stylish travertine backsplash. Store all of your goods just where you want to – out of sight in the convenient walk-in pantry. The large two story sunroom is tiled and has amazing views of the property. There are so many possibilities – it could even be used as a bonus room or office. Located on the main level is the master bedroom and en suite. The large master features plenty of light, a ceiling fan and walk-in closet for all of your storage needs. Enjoy soaking in the Whirlpool tub after a long day. Youell appreciate the separate his and her vanities flanking the tub, along with the separate shower. Also on the first floor is another bedroom thates currently being used as an office space. It features neutral carpeting, double hung windows and its own private bathroom. Upstairs are two more large bedrooms, each with a large closet, ceiling fans and a shared bathroom. The rooms are so spacious you could even use one as a game room, theater room or kids play room. Enjoy barbecuing and entertaining friends on your huge backyard deck. Therees so much land you can finally build that pool youeve always wanted. Beautiful vistas. Endless possibilities. This is the perfect property for horse lovers and nature lovers alike. Get away from it all and enjoy the quiet, wide open spaces. The home at 6539 Eudaily Covington Road is zoned for College Grove Elementary, Page Middle and Page High. For more information or to schedule a tour, contact Dee Russell with Realty Trust Residential today, (615) 207-4585. Visit DeeRussell.com for more information.